*Especially from a white dude who makes some good points but buries them in a whole lotta condescension and sarcasm. Image by plaisanter~, via Flikr. Used under creative commons. Safety pin. I’m wearing one. My daughter wants to wear one to school. She understands the responsibility it entails. She knows that the safety pin means “I am a safe person.” She knows that if anyone at her school is being harassed, she will go stand next to that kid. She knows who in her grade might be a target. I hear the critique. I saw the article because two WOCs posted it. I know they resonated with it because of long experience with lip service and/or betrayal by white feminists. I hear that. 1) If a big white Trump dude is bearing down on me screaming “GO BACK TO YOUR COUNTRY”, I am not going to check the progressive bona fides of a person near me wearing a safety pin. I will only be grateful to know there’s another person nearby who won’t assault me and is demonstrating a willingness to help defend me. 2) I’ve heard from plenty of POCs and Muslims as well as some LGBTQIAs that they feel surrounded by enemies. 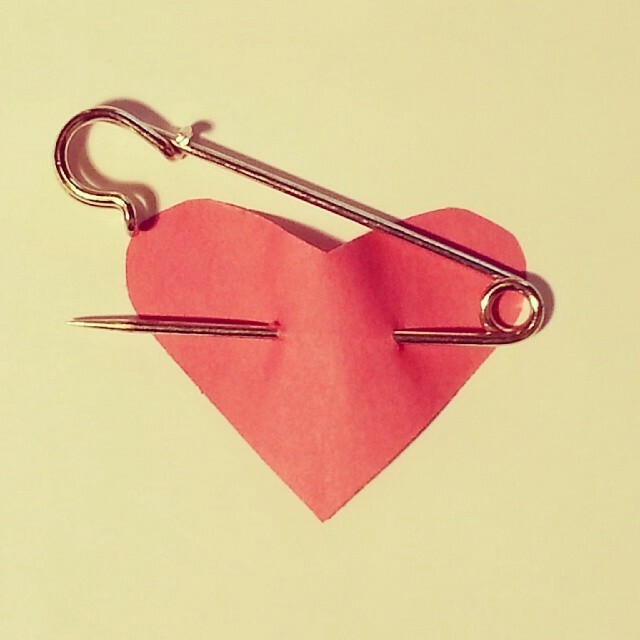 The safety pin helps them feel that they are not isolated and alone. 3) We can’t all go around all the time wearing a sandwich board that reads “Black and Latinx and Asian and First Nations and People with Disabilities and Muslim and Sikh Lives Matter.” A safety pin is cheap, ubiquitous, and easy to wear with any outfit. 4) For some white people, putting on a safety pin may be the first step toward allyship that they have ever taken. By putting it on, they make themselves a target for Trump supporters IRL and online to call them whiny liberal losers. Then liberals/progressives/leftists turn around and tell them they are embarrassing themselves by wearing a safety pin? Yeah, that’s how we lose. 5) When I put on a safety pin, I am recommitting every day to stand up to oppression, whether in the form of harassment or in the form of legislation enacted by a Trump administration. I hope the pin helps others to think, every single day, about how they can resist our nation’s slide into a morass of hatred and prejudice and assist others with less privilege to attain equal rights. In fact, I will say this as a woman of color, as a member of the LGBTQIA community: if you are wearing a safety pin, this is what I expect of you. 6) Some people have said that white supremacists have co-opted the safety pin, but I haven’t seen documentation of this so far. Given the level of Trumpist ridicule heaped on the safety pin movement, I’m guessing that many if not most Trump supporters will proudly NOT wear a safety pin. If you are also wearing a safety pin, for you I am posting a comic that explains how to support and protect someone targeted for Islamophobic harassment. This guide is broadly applicable to other -isms and -phobias. Wearing a safety pin is only one step. We are facing an unprecedented threat, and this will be a long struggle. It will require listening and following the leads of the communities who are most threatened. I hope everyone wearing a pin will continue to stand with those communities over the next four years and beyond. I have read your responses. I cannot reply to you all individually point-by-point. It’s interesting to me that all of you so far seem to think this piece indicates that I am not and have not been engaging in dialogue with the points and the people you brought up. Moreover, you don’t seem to have bothered to check my subject position before you responded. So to answer you all broadly, I’m going to share a Facebook post I made last night. I wrote this in response to a dear friend who is white, queer, and woke. She wrote, “I am broken.” What broke her was not the results of the election itself, but the anger and vitriol coming at her from the left. We are not now and will never be a monolith. We are never going to agree on every single philosophy, action, and strategy. That’s OK. Disagreement and opposing points of view are good and can strengthen us. But harsh policing, rigid discipline to an orthodoxy, and litmus tests of righteous purity or standards of “wokeness” can destroy our movement as surely as an autocratic regime can. In that vein, I want to state, unequivocally, that the repercussions Ijeoma Oluo faced for questioning the efficacy of safety pins were horrific. I definitely think that was a moment when white women were required to step in to handle their people. I’ve been here before, and it is neither pretty nor productive. We can disagree, we can critique, we can educate, but we need to treat each other as friends and comrades, or we’ll tear each other to shreds without the autocrats needing to lift a finger.